We’re excited to invite you to our Reef Exploration, Experiences, and Fun (R.E.E.F.) Celebration next Saturday, November 7th from 11am-2pm. This event is all about celebrating and recognizing GCCRMP members and partners and their efforts to be stewards of our ocean. Get a chance to see some basic results from data collected by our trained GCCRMP members and what it all means! But it’ll be much more than just sharing data. for interesting and education displays. Meet passionate people who can share how they’re working together to take care of our coral reefs and our environment. Who knows? You might find a new service learning opportunity or even the link to a new volunteer activity that you’ll really love. We’ll mix it up with our Live Showcase where we’ll shine the light on other programs and projects that gives the community an opportunity to learn more about and participate in natural resource management and stewardship. We need to recognize all these collective efforts and get involved anyway we can. Bring the kids to meet and take photos with Piti Pete, our surgeon fish friend, and other friends from the reef. 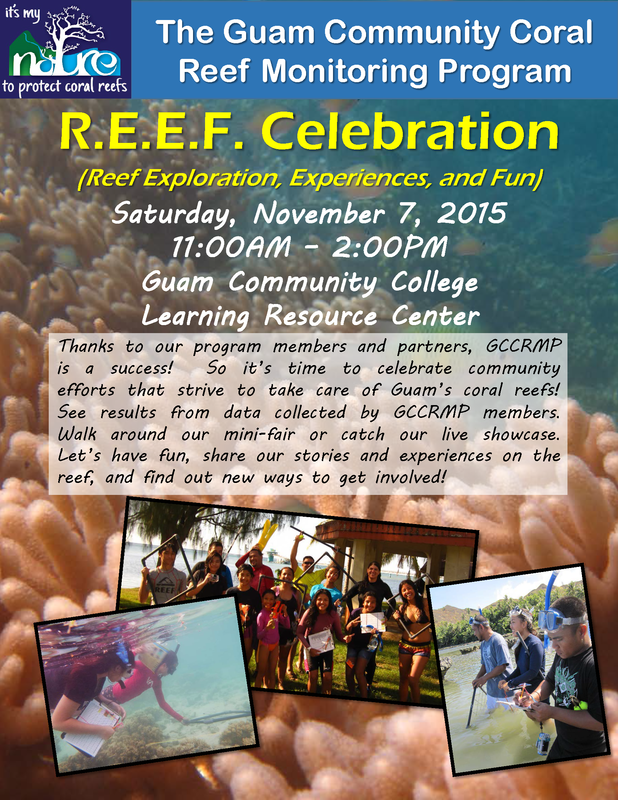 We hope you can join us for this fun event and celebrate all of our efforts to be stewards of Guam’s environment!